Caroline Bay is destined to become an unprecedented mixed use development for Bermuda, anchored by a highly desirable brand name hotel. The proposal will transform a derelict brownfield, waterfront site, with significant remediation issues, into a highly desirable destination comprising eighty-four deluxe hotel suites in small low rise buildings, two presidential villas and a premier spa. The Hotel single story Arrival village seeks to make an understated impact with Arrival court, conference facility, two waterfront restaurants, beaches and waterside pools. 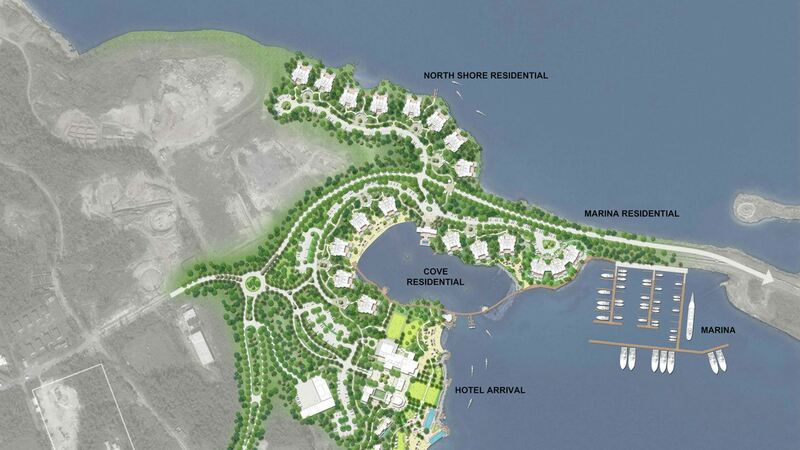 In addition, 149 waterfront residences are proposed to the north of the hotel, along the shoreline, terminating in a state of the art marina to the south of the existing causeway. The Design promises to be a modern interpretation of Bermuda vernacular designed by an international and acclaimed Project Team, set in a verdant Landscape of endemics, natives and exotic planting with walking and cycling trails offering glimpses into a varied range of Bermuda’s natural flora and fauna.